Tell — Are We There Yet? 500 Exhibition Kits have been distributed to schools around both greater Auckland and the rest of New Zealand. They use the colours, design and themes of the larger Are We there Yet? 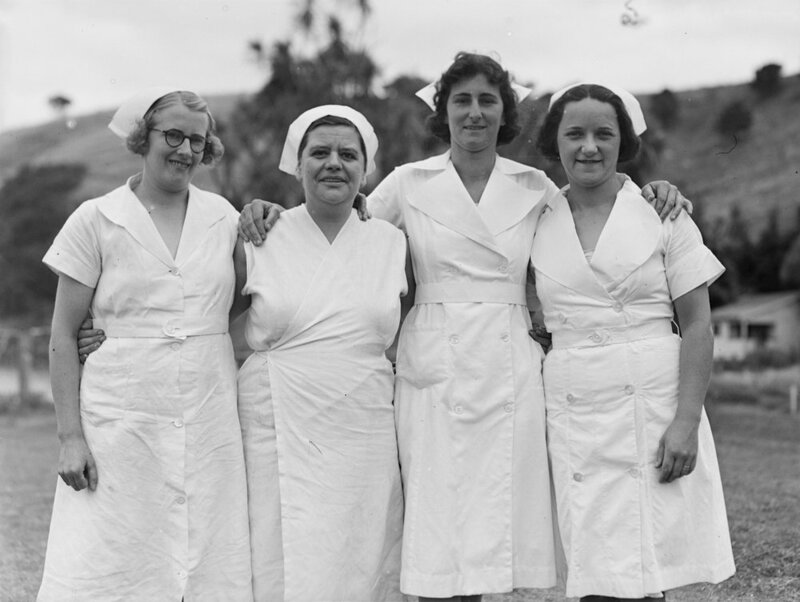 Women and Equality in Aotearoa New Zealand Exhibition at Auckland War Memorial Museum. Your kit also contains vinyl sticky frames and reproductions of actual artefacts in the larger exhibition. 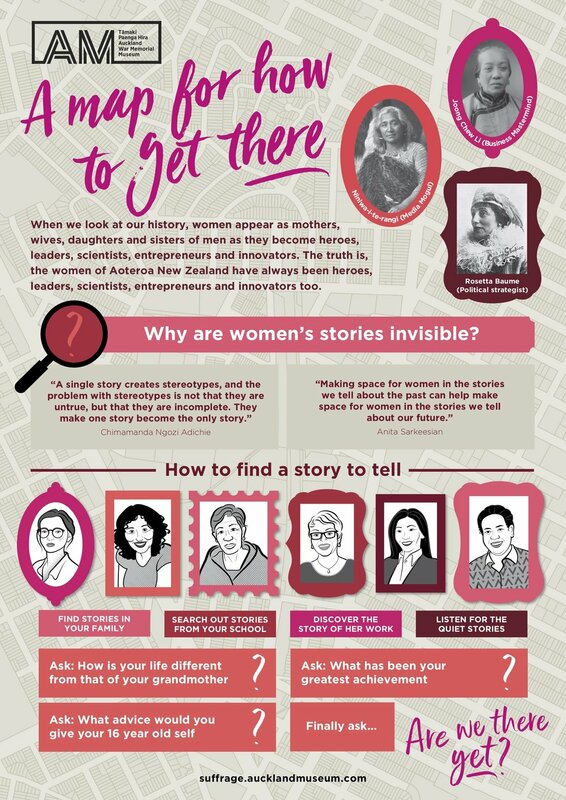 Our vision is 500 smaller individual exhibitions across wider Auckland (and New Zealand) that echo the kaupapa of the larger one (and celebrate a whole heap of women’s voices). Outlined below is a brief plan for how to get there. There are wonderful women everywhere...women who you could interview. 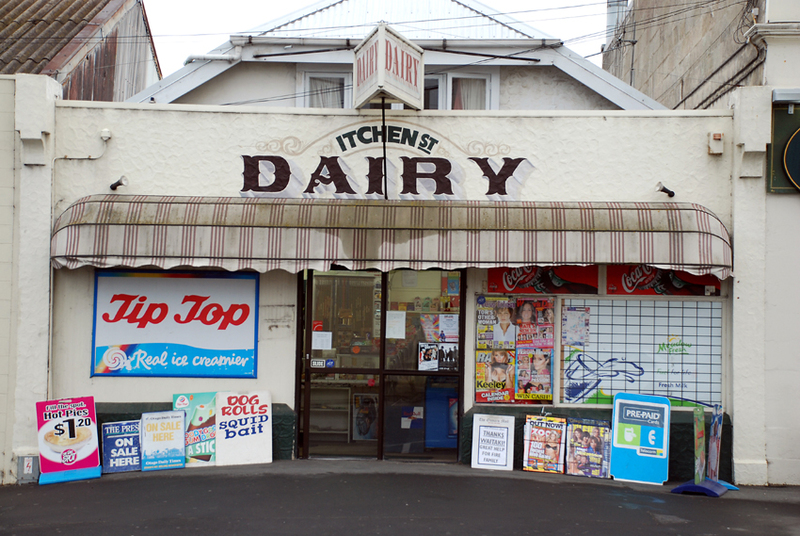 Local business women, past Head Girls, refugee women, women in your local rest home, great female teachers, local female MPs, Old girls of your school, Women born outside New Zealand, women living in the same street.... There are wonderful stories everywhere waiting to be told. Use the Are we There Yet? Pinterest Board for inspiration. Use the 'A Map for how to get there' Fact Sheet. It's really cool, you can find it in your kit or click on the button below to download a copy. The fact sheet covers why you might create an exhibition such as this, as well as ideas for starter questions to ask your interviewees. Medical student, journalist and essayist Emma Espiner is a medical student at the University of Auckland. She comments on social issues, health, and politics for Newsroom. She was asked to share her thoughts in response to a a piece from the exhibition (she chose the Broadsheet Magazine in your kit). 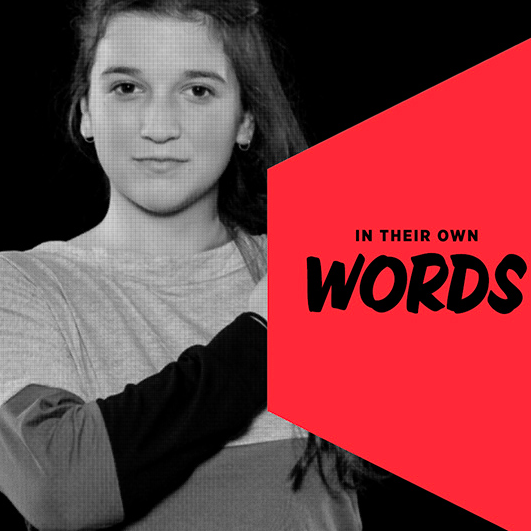 Listen to her speech and think about which quote you would select if she was one of the subjects of your exhibition. what about all the fabulous catholic school sisters or people who remember being taught by them? Your kit contains 8x vinyl sticky frames ( for the black and white photos of the women you interview), 8 sets of sticky corners ( used to display at the corners of the quote, from each of the women you interview), 32x 'draw a scientist and other professions' cards for the students, 8x figure NZ statistics cards that help paint the picture using data and 10 x reproductions of actual artefacts from the larger Auckland Museum exhibition. Your exhibition will be unique to you and your community, but the one thing they will all have in common is they will be powerful. Listed below are apps, style guides, tips and tricks to help you put your exhibition together. Ask your students to help identify the group of women they would like to talk to. Come up with a list of open ended questions that can be asked to guide you through the interview process. The aim is to get the women you are talking with to share their quiet stories, memories and experiences. Use the ‘A Map for How To Get There’ Fact Sheet as ideas for some starter interview questions. Make arrangements of how and when you will meet up, or connect. When you are in their company do ask how each interviewee wishes to be described and how to spell their name correctly, if need be. You will also need to take their photo or arrange for one to be sent to you if you did not meet up face to face. It is important to explain to the women you do interview that you will be using a little of what they share in an exhibition celebrating women. You may like to invite them along to the opening. Use StoryCorps to conduct your interviews with at least 8 women from within your community, or through personal contacts. Take a look at the way that the Auckland Museum Exhibition Designers and Curators chose to present the quotes in the Are We there Yet? exhibition. There is a great deal of planning that goes behind any exhibition, so investing time in this stage is important. Make a large, rough visual plan of how you would like all the information and items to come together in your exhibition. This will be most useful as a guide when it comes time to installing your exhibition. Estimate the surface area you will need for the exhibition and decide where that would best be. Choose a space that is respectful of the mana of your interviewees and consider whether it provides access for wider audiences to view it. Some ideas may include the school library, the hall, school office entrance, the large window that opens onto the school carpark, a large unused whiteboard. There are many different ways to display things effectively and researching different ideas can be useful. Or feel free to use School Kit HQ exhibition as a model...we would be flattered. Print out the 8 photographs you took, in black and white, of the women who will be included in your exhibition. Remember to take a look at the size of the vinyl frames in your kit, as they will determine the sizes you make them. Select a quote from each woman and type it up with their name and title displayed. If you would like to achieve a similar look to that of the museum, use recommend these fonts to help you achieve that: Brandon Grotesque B for the quote, Selima for their name and Arimo for their title. Collect the 32 illustrations on the 'draw a scientist' cards. 10 replica items from the Kit. Any special items that you have found to help tell the story e.g. poem, photos. The Title of the exhibition decal and the Auckland Museum logo. It is time for all the stars to align and for your ideas to come to fruition. All your items - poems, cards, quotes, images and reproductions will be displayed in a powerful and inspiring visual feast. Consider arranging an opening event for your exhibition and if this is something you would like to do, do not wait until the exhibition is up, plan it now. When your exhibition is finally up and looking fabulous, do take the time to stand back and ask "Are we there yet?" This is a task that will suit some students more than others. Look for those who are careful, have an eye for detail and are willing to persevere when things do not quite go right. They will need to play around with placement at times to get it right and this all takes time. so a team of dedicated can-do kids are required. The vinyl decals stick best to smooth, flat, clean surfaces. It would be worth your while to test a sample of the decal from those provided in the kit, on the surface you have selected. Leave it overnight, come back and check to see if it has attached adequately, before putting up your whole display. Once you are convinced the surface is the right one, we recommend that you start by placing a central piece ( we selected the Title of the Exhibition and off set it from the centre slightly) and work out from it. Use blu tack to attach the items and printed material to the wall. To cut your 8 black and white photos to the perfect size for the frame you select, attach the decal from the centre of the fame ( i.e the piece that would otherwise end up in the rubbish), attach it to the back of the photo you are framing (put it up to the light to help you work out where to stick it), then cut around it. Hey presto- perfect size and placement. Aim to display the photo of each woman you interviewed as close as possible to their quote- to allow people who are looking at the exhibition to connect the two. This connection can be achieved in other ways if necessary also. Use the vinyl corners provided to frame the quotes. They do look great with a cm breathing space around the edge. Give each item it's own 'breathing space'. Consider balancing colour, negative space ( the spaces where there is nothing ), size of items. Follow your plan, but be prepared to move things around to help achieve the desired result. Use the pinterest board to help you with ideas. Teacher SupportTwitterFacebookInstagramTell us who inspired you.